that the tray is an imitation made at the end of the 19th century and the beginning of the 20th century using galvano-plastic procedure. This would question the value of the item. Therefore, a detailed analysis of the tray was carried out at the Faculty of Mechanical Engineering and Naval Architecture in Zagreb, in order to determine the technology of its production and thus, its origin as well. Due to the value of the item, the emphasis during analysis was on the application of non-destructive testing methods. Apart from the mentioned methods, the destructive instrumental methods were applied as well. These analyses have included a very small area of the tray so as not to damage its homogeneity and continuity. The paper describes the applied methods and the obtained results. The concluding mechanism about the interrelation of the obtained results with the possible technologies of producing the tray has been described and explained. At the Croatian History Museum, Zagreb, Croatia, there is a sacral tray for wine and water registered under the inventory mark Sacral Collection 33242, Figure 1. The tray is oval with two round depressions symmetrically set in the middle and decorated by a stylised bay-wreath. It is silver-gilt, and 36x30,8cm in dimensions. However, the origin of the tray has not been completely explained yet. It is assumed to be a work of an unknown master from Augsburg, end of 17th century, and made using the techniques of embossing, engraving and chasing. However, during restoration some details were noticed that suggested a completely different conclusion. At the end of 19th century very often galvanoplastic technique was used for the mass production of items made of silver, copper, and some other metals. 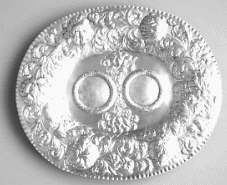 Among other things it is known that this technology was also used to make trays of this style and shape. Therefore, it is of great importance both for the collection, and for the museum itself, to determine the exact origin of the tray, since this will also determine its value. The main condition in analysing the tray is to use non-destructive testing methods, i.e. to avoid any possible damages during testing. The tray was analysed at the Faculty of Mechanical Engineering and Naval Architecture in Zagreb, Croatia, at the Laboratory for Precise Length Measurements and the Laboratory for Materials. Because of the lack of experience in such analyses, it was first necessary to get acquainted with the possible manufacturing technologies and their characteristics. Embossing is a technology characteristic for 17th century. Using hammer and variously shaped tools, ornaments and other impressions are produced on a flat plate by cold forming. Galvanoplastic is an electrical-chemical procedure first established by Alessandro Volta (1745-1827). On the cathode immersed in electrolyte there is a negative of the item which is to be produced. The anodes contain the material: silver, copper which is deposited on the negative, the cathode, by means of electric current, Figure 2. The analysis of the mentioned procedures leads to a conclusion that the items thus manufactured differ regarding parameters such as chemical composition, microstructure and their dimensions. Therefore, the performed analyses took these into consideration. Macro and microstructure of the tray were analysed. Macrostructure analysis of the bottom of the tray shows two areas: smooth parts on which the tray is supported which can be cleaned and parts in the depressions which are not subjected to external influences. 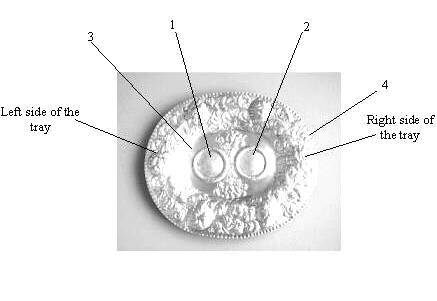 On these parts, "droplets" can be noticed, which are characteristic of galvanoplastic technology and they are visible on the contact surface with the mould, Figures 3 (a and b). Microstructure analysis of the tray cross-section would provide the safest insight into its manufacturing technology. However, since this item must not be cut, the microstructure was analysed at its edge. Microstructure is presented by means of replicas: the tray edge was ground rough and fine and polished, then attacked by a combination of acids for silver. The obtained microstructure is shown in Figure 4. The analysis shows a directed microstructure near the upper (A) and bottom surface (B) of the tray, whereas the structure in the middle is non-directed. 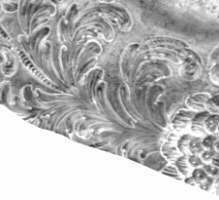 This proves that the curvilinear shape of the tray edge was generated by some cold forming (bending, pressing, embossing), whereas the non-directed microstructure in the middle indicates that the tray was produced from a silver plate which was then further treated. The tray thickness was measured at four measuring surfaces as presented in Figure 5. On the measuring surfaces No. 1 and 2, the thickness was measured at 40 points, and the tray thickness at measuring surfaces 3 and 4 was measured at 20 points. Measurement results are presented in Table 1. In case of results obtained by measuring the tray thickness at measuring surfaces 3 and 4, a difference in thickness on the left side compared to the right side of the tray may be noticed. Left side of the tray was declared to be the one whose bottom of surface 1 shows four tiny dotted damages caused by corrosion (tray sides are marked in Figure 5). The results of thickness measurements on the left and right side of surfaces 3 and 4 are presented in Table 2. 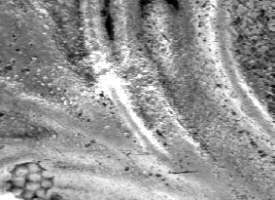 At characteristic surfaces marked in the photo (Figure 5), their roughness was tested. These tests were carried out by contact method using electronic mechanical device with Perthometer S8P probe. Roughness parameters Ra and Rz were measured at each marked surface on the upper side and the bottom of the tray. All measurements were carried out under the same conditions, using Gauss electric filter of boundary value lB = 0.8mm with evaluation length of l = 4mm. On every surface measurements were carried out at five measuring points, and these were used to calculate mean values of roughness parameters. Mean values of roughness parameters with estimated standard deviation for all the tested surfaces on the upper side and the bottom of the tray are given in Table 3. Furthermore, for each tested surface one characteristic profile was recorded with the same vertical and horizontal magnifications. 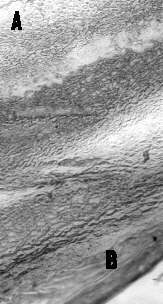 Also, on the tray surfaces on the bottom, topographic photos of the tested surfaces were recorded. Figures 6a and 6b show topographic photos with corresponding profiles for surfaces 3 and 4 (the finest and the roughest treated bottom of the tray). Based on the tray thickness measurement results shown in Table 1, it can be concluded that the thickness of the tray is greatest in the middle (surfaces 1 and 2). From the middle of the tray towards its ends, the thickness decreases. It can also be concluded from the measurement results shown in Table 2, that the left side of the tray is thinner in relation to the right side. Continuous decrease of tray thickness from the middle towards the ends shows that it is very likely that a manual technique was used in manufacturing, that is, that the tray was produced by embossing technique. Uneven roughness indicates manual finish of the characteristic surfaces of the tray. This is especially emphasised on the surface No. 4 where there is a large difference between the roughness of the top and the bottom. At the Institute Rudjer Boskovic in Zagreb Pixe analysis was used to perform quantitative analysis of the chemical composition of the tray. The results of analysis are shown in Table 4. Due to relatively impure silver, one may conclude that the material was not obtained by galvanoplastic technology. Based on the performed testing it may be concluded with very high probability that the tray was made by cold forming technology, most probably embossing. This indicates that the tray may date back to 17th century, but there are no solid proofs for that. It is namely possible that this technology was used also in the 19th or beginning of 20th century. Unfortunately, this cannot be determined by the available knowledge and laboratory methods. However, if one takes into consideration that this research is the first of its kind in Croatia, the results are satisfactory to begin with. Since there is a great number of such items whose origin has not yet been determined, such work has to be continued. It is believed that further work, i.e. analyses of a greater number of museum items, contacts with experts from abroad, and objective comparisons of the obtained results, will allow significantly improved accuracy in results to be obtained, and it will be possible to date various museum exhibits, as well as to discover secret technologies used by the ancient masters of art. We would like to thank to employees of the Croatian History Museum and the Croatian Museum of Art and Trade, who participated in realization of this project.